Was your child injured because of a defective Magnetix play set manufactured by Mega Brands, Inc. (formerly Rose Art Industries)? The high-powered magnets used in Magnetix toy building sets have caused serious and potentially deadly internal injuries in dozens of children who swallowed either a loose magnet or a toy part containing a magnet. Some 4 million dangerous Magnetix toy set, manufactured in China for Mega Brands, were recalled by the company in 2006 and again in 2007, following serious injuries to children. Design changes to make the Magnetix toys safer were implemented after March 2006, but many older model toys remained in stores and in homes long after the Magnetix recalls were issued. If your child was hurt by one of the high-powered magnets contained in these toys, please contact the Magnetix injury lawyers at Alonso Krangle LLP today to learn more about the legal options available to you. 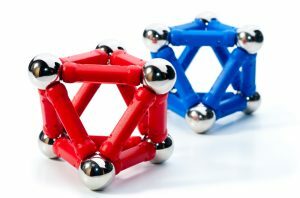 Magnetix toy sets consist of building blocks embedded with magnets that allow the parts to connect to metal balls. In older, recalled models, the embedded magnets can detach, especially over time as the toy ages. If a child swallows or inhales more than one detached magnet, the magnets can attach to each other internally, causing potentially fatal intestinal perforations and blockages or serious lung injuries. Emergency surgery is required to remove the magnets. The U.S. Consumer Products Safety Commission (CPSC) and Mega Brands issued two recalls of Magnetix toy sets in 2006 and 2007. In April 2009, the CPSC announced that Mega Brands agreed to pay a $1.1 million to settle allegations the company violated federal law by failing to properly report Magnetix injuries to the agency. According to the CPSC, at least 1,500 incidents of magnets separating from plastic toy parts have been reported, with one death, one aspiration and 27 intestinal injuries documented. The death involved a 20-month old toddler. In the case involving the aspiration, a 5-year-old boy had to have magnets surgically removed from his lungs. The Magnetix toy sets involved in the recalls contain up to 250 plastic building pieces and 1/2-inch diameter steel balls. The building pieces include 1 1/2-inch squares, 1-inch triangles, cylinder rods, flexors, connectors, x-tenders, and curves and come in an assortment of colors such as metallic, primary, translucent, and glow in the dark. The recalled Magnetix play sets were sold by large retail chains, as well as toy and arts and crafts stores around the country. The Magnetix building sets sold for between $20 and $60, depending on the size of the set. If your child suffered serious internal injuries after swallowing a magnet from a Magnetix play set, you may be able to file a lawsuit to obtain compensation for your child’s medical bills, pain and suffering, and other damages. To learn more about the legal options available to you, please contact the Magnetix injury lawyers today at Alonso Krangle LLP by filling out our online form or calling us.